Where do I use my Lily Lolo voucher code? Copy a code from us and follow our link to the Lily Lolo website. Here you can browse for the beauty products you want. Click ‘Add to basket’ on your chosen products and then ‘checkout’ once you’re finished shopping. On the ‘Shopping bag’ page, under your items, you’ll see an ‘Offer code’ box. Paste your code into here and click ‘Apply’ to redeem your savings. 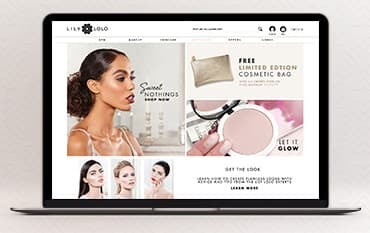 Offering an expertly formulated range of high-performance, high-quality mineral makeup must-haves to help you achieve flawless natural beauty, you can find everything need to ensure you look gorgeous at all time at Lily Lolo. Women love to look and feel beautiful both on the inside and out, and with these gorgeous makeup products, you can let your inner beauty shine. Every look starts with a solid base, so explore the beautiful collection of Facial makeup from Lily Lolo featuring Mineral Foundation, Finishing Powder, Mineral Concealer, Corrector. All can be applied effortlessly to achieve a flawless finish. Choose your shade and start building your collection up today! The eyes are certainly the first place anyone you encounter will notice first, so be sure to make an impression. Whether you're working a winged liner, a smokey eye or a subtle bare look, you will find exactly what you're looking for with Lily Lolo! Discover the glamorous range featuring natural mascara, mineral & pressed eyeshadow, primer & eyebrow filler and various eye makeup palettes including beautiful shades. Make a statement with Lily Lolo! Lily Lolo BB Cream is the perfect solution for evening out your skin tone. Packed with nourishing and anti-ageing ingredients and mineral pigments to help blur imperfections and even your skin tone. BB cream is Ideal for light coverage when used alone for healthy looking, radiant skin. Team this up with the Lily Lolo Makeup Mist; A refreshing Mist that sets make-up and prolongs its hold! Makeup mist is specifically formulated to leave make-up looking flawless without smudging or setting into fine lines. The perfect final step for flawless, long-lasting makeup. Lily Lolo's ethically sourced and wholesome natural mineral cosmetics are created to be gentle on your skin, flatter your natural beauty and spare your purse expense. You'll find all the makeup and accessories you could want - from foundation and concealer to blush, mascara and lipstick. Beautify yourself for less with these money-saving Lily Lolo voucher codes.